Happy New Year, dear readers. If you're a subscriber and received dozens of of posts you'd already read, please accept my apologies. We were transferring the posts to my website, www.BarbaraAbercrombie.com and they flew out like birds, landing everywhere. 2014! You have a whole new year in which to write dangerously. (And if you read Korean, A Year of Writing Dangerously has just been published in Korea. I find it hilarious that they put my photo on the cover.) Have you made a list of resolutions for your writing? It's a good idea. We tend to accomplish what we write down. Will you write the first draft of a novel? The final draft? Or a memoir? A bunch of essays? Poems, a book for kids or simply start a journal? Make your list specific. But be gentle with yourself. Getting something written often means getting started over and over and over. PS If you read English, not Korean, A Year of Writing Dangerously is available through Amazon or your local bookstores. If you're facing a wall of writer's block, there's Kicking in the Wall. And if you just don't want to write, come to my new cooking blog, www.TheIntimidatedCook.com and give a dinner party for your friends. This is such an inspiring story from the New York Times, and at the same time you read it and weep. But there are still small independent publishers out there so maybe it's time to finally send your manuscript out. Donal Ryan, a civil servant from Limerick, Ireland, wrote two novels. He sent them to agents and publishers and got back 47 rejections over three years. Finally an intern at Lilliput Press in Dublin fished “The Thing About December” out of the slush pile. Around the same time, an editor at Doubleday Ireland took interest in “The Spinning Heart.” Suddenly Mr. Ryan had a two-book deal, and from there his fortunes only improved. The Booker Foundation announced last week that “The Spinning Heart” had made the cut for the Man Booker Prize long list. Such things happen. Paul Harding had trouble finding a home for his debut novel, “Tinkers.” He signed with Bellevue Literary Press, a small publisher, but “Tinkers” remained so obscure that The New York Times Book Review ignored it. Then it won the 2010 Pulitzer Prize. These stories hearten struggling writers and everyone else who struggles too. They allow us to believe that our luck could change at any moment; that if we persevere beyond the point of reason and perhaps good taste, we may finally succeed. These stories, finally, tell us that a healthy book industry is a diverse one, in which it’s possible for a talented author to knock on several doors before resorting to self-publishing. The more gatekeepers, the better the odds for the next Donal Ryan. As it happens, the industry is going in the opposite direction. The news about Mr. Ryan came on the heels of a merger between Penguin and Random House to form the world’s largest publisher, with more than 25 percent of the global book business. Assuming the merger unfolds in the usual manner, the company will announce layoffs due to “redundancies,” meaning fewer imprints with fewer editors looking for the next Donal Ryan. Parties and Book Readings: Invitations! Please come to Diesel Books in Brentwood next Tuesday (June 18th) if you're in LA. We're having a party for KICKING IN THE WALL and some of my fabulous students who are in the book will be reading, and I'll talk about how to kickstart your writing with 5 minute exercises. Oh, and did I mention the wine? If you live in the South Bay, we'll be doing both reading and party at Pages bookstore in Manhattan Beach. (June 27th) Both bookstore events start at 7:00. Next Thursday, June 20th, I'll be reading with five other writers in Victoria Zackheim's "Women's Voices" at the Pacific Palisades Library at 6:30. I'm teaching a three hour writing workshop through UCLA Arts and Healing on Saturday, June 22nd, 9:30 - 12:30 in Santa Monica. Come join us. For more information: http://www.uclartsandhealing.net/programs.aspx , on August 21st a mini-workshop at the Santa Monica Library 3:00-4:00, and a three hour workshop at Book Passage in San Francisco October 5th. My UCLA Extension classes for the fall and winter are Advanced Non-Fiction in October and November for six weeks, and a four day intensive version of Courage & Craft in the Writers Studio In early February. Hope to see you at a bookstore reading or in a workshop! My latest book, Kicking in the Wall has just been published by New World Library. A companion book to A Year of Writing Dangerously, it has 365 writing prompts and exercises, inspiring quotes, plus examples of what sixteen of my students wrote in five minute exercises. I do understand that this gets tedious - this buy my book, come see me, stuff. But KICKING IN THE WALL is now available - and I'm available, well just about everywhere. This weekend I'm talkiing to the Californa Writers Club in Woodland Hills, then on May 16 at Flintridge Books in La Canada at 7:30 , and a week later May 23 at Pages in Manhattan Beach at 7:00. The very cool thing about the bookstore appearances is that some of my students who have their five minute exercises in the book will also be reading. And they are wonderful and funny and fascinating. You may be tired of me, but these people are fresh faces! Oh, yeah. And buy my books please. 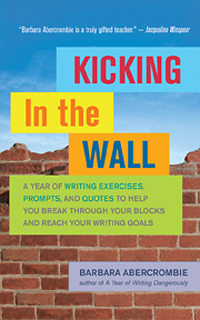 KICKING IN THE WALL is actually a companion book to A YEAR OF WRITING DANGEROUSLY. One or both would make a great graduation gift, or if you have parents who might want to write their family history, it could be a Mother's Day or Father's Day gift. Remember how I'm always saying don't get your hopes up that the world will change when you get published? Well, I just got a very funny email from my student Jeri Okamoto Floyd on this subject. Some of her wonderful work is featured in Kicking in the Wall (along with fifteen other students) - and her copy of the book had just arrived from Amazon. She was very excited. She took a picture of it in her office. (above) When her girls came home from school she told them the good news and got ready to read some of her pieces to them. They said, yeah, yeah, yeah, Mom, and got a snack from the fridge and disappeared. So she read her work to her dogs. I drew a line in the sand at Twitter. I was not going to twit or tweet or any of it. I finally caught on to Facebook (and heaven help me I really like it) but Twitter? No way. However the Marketing Whore has another book coming out next month, so....what can I say? Please follow me @BabsAbercrombie. And here's my photo for the new book taken by my daughter Brooke Abercrombie. Kicking in the Wall is available for pre-order on Amazon. When Patti Smith was plagued with writer’s block — “scattered and stymied, surrounded by unfinished songs and abandoned poems” — playwright Sam Shepard advised her, “When you hit a wall, just kick it in.” In these pages, Abercrombie shows readers how to do just that. Like a workout with a top trainer, her writing exercises warm up, stretch, and build creative muscle. Quotes from famous writers inspire each day’s exercise. Though Abercrombie says readers need only commit five minutes to each exercise, she writes, “I’ve seen novels, memoirs, and many essays get started” in those five minutes, “and a lot ended up being published.” Her playful, powerful method is ideal — maybe even essential — fuel for writers trying to get off the starting block, persevere through challenges, and cross their personal creativity finish lines. This is embarressing to tell you but my refrigerator is almost empty. Every morning I really intend to get to Trader Joes, intend to buy food, but I end up in my office at my computer for the whole day instead. Yesterday in desperation, not to mention hunger, R. went to Vons and bought himself sandwich stuff. I continued to type away. I'm on a roll. I can't help it. He had to take me out for sushi last night because of this lack of food problem. Times of inspiration, energy and total focus on writing, no matter how much I love this job, are so rare and precious that I just don't want to waste a minute of it. And it's so strange because both projects I'm working on have been rejected - one recently and one a few years ago. Somehow I've convinced myself I now know exactly what they both need and how to do it. And I'm doing it. Or trying to. Stay tuned.